"Of course, he is still growing and learning. It is obvious that his performance was great and well structured, but it can still use some improvement. He's in ninth grade, but 15 is also the entry age for adult competitions. Slowly but surely, he will continue nurturing his talent because he is a very gifted violinist who is also madly in love with music and his violin. One day, he will be able to perform repertoires of greater depth and difficulty,"
"Violin means everything to me. If I had to live my life without it and choose another profession, I don't think I could. What is amazing about it is that the violin chose me. I wanted to play the violin ever since I was little, but I used to be really horrible at it. I couldn't even hold my hand properly, it was so uptight, but Mrs. Magdalena Ursu guided me and put me on the right path." "This young man learns something new with every year; he adds to his technique and musical knowledge. He is always searching for more and feeling a lot. He also started writing music, he wants to play the piano, he wants it all and let's hope that it's all for the best. 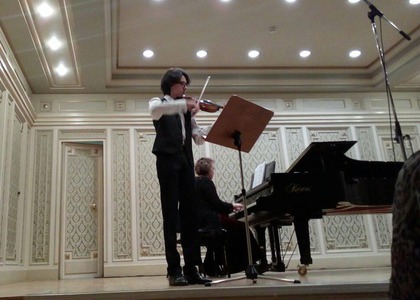 To perform four sonatas in a recital at only 15 is exhausting, but he did an amazing job.